Jeanne said: "There is a decent second hand English bookstore in Nerja in Andalucia, Spain. Actually, there are a lot of English book stores in Andalucia but most are very expensive like the ones in the malls, but the Brits do not mind the price ( just Americans do)"
The Nerja Book Centre sells second hand English language books, DVDs, videos (available to rent as well). In the bookshop you can also get free periodicals on Nerja happenings, events, etc so one may as well call them a tourist gathering point of Nerja, a comfortable place where people can get information on the town while browsing through the vast selection of books. To get to Nerja Book Center one has to go past church from Balcon de Europe and take first right - really easy to find. The prices range from as little as 90 cents for a book, though most of them range from 3 to 4 euros - still a good bargain for second-hand books. We shouldn't forget to mention that if you return the bought items, you get a discount on your next purchase. Nerja Book Centre, the second hand bookshop, has approximately 25,000 books in 12 different languages. 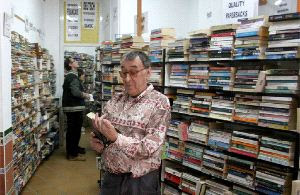 Its owner, Derek Hands, originally from England, has always been a big fan of books and reading, and his hobby became his living when he moved to Nerja and opened the Nerja Book Centre, over 25 years ago (the bookstore celebrated its 25th birthday in Feb, 2007). He started with around 100 books on his shelves and now there are 25,000. Most of the books in the store are in English. But as well as English books there are books written in German and Spanish, Dutch, French, Norwegian, Swedish, Finnish - a total of 12 different languages. All the books in the store are arranged alphabetically and the purchase follows the motto "We sell, buy and exchange books" - a sign at the entrance to the bookstore serves to show that this bookstore is definitely different than those which sell new books. I called into the shop in May 2011 but was a bit disappointed. The stock was mostly current best sellers by top authors. A few travel books also but limited selection of really interesting older cultural stuff.